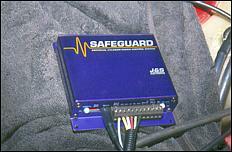 Sensing when an engine is detonating has become more and more important in recent years. In older cars, the reduction in the lead content of fuel has meant that detonation is more likely to occur - especially when the comp ratio is wound up to give good performance. In factory turbo engines, dramatically increased boost means that detonation is very probable, while in any engine, poor mapping of the ignition advance can easily lead to detonation. But while sensing when detonation is occurring initially looks to be pretty straightforward, it becomes much more complex when the subject is examined in any depth. 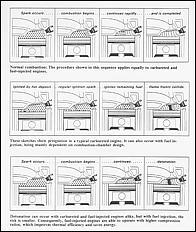 Engine detonation occurs when the air/fuel mix ignites within the combustion chamber in an uncontrolled manner, instead of by the progressive action of a moving flame front. The terms 'ping' (a light, barely observable detonation) and 'pre-detonation' (detonation caused by the ignition of the charge slightly before the full ignition of the flame front by the spark plug) are also commonly used. 'Knock' is another synonym. One definition of knock is "an undesirable mode of combustion that originates spontaneously and sporadically in the engine, producing sharp pressure pulses associated with a vibratory movement of the charge and the characteristic sound from which the phenomenon derives its name". If detonation is allowed to go on for more than few seconds, the very sudden pressure changes within the cylinder can damage the engine. In a worse case scenario, pistons, rings and even the head itself can suffer major damage. Obviously, heavy detonation is something to be avoided! Note also that the higher the specific power output of the engine (ie hp per litre), the greater the likelihood of damage if detonation occurs. In everyday driving, detonation is most likely to be heard when the driver is using a gear too high for the engine speed and load conditions - like climbing a steep hill with the right foot flat to the floor, while in third gear and travelling at 40 km/h. Depending on the engine, detonation can sound like a 'ting, ting' noise, or even a little like coins rattling in a coin tray. However, in some engines, the audible note is much deeper when heard from the cabin. In turbo/blown cars, or cars where the compression ratio has been substantially increased, detonation can occur at high engine speed and high loads, making it very difficult for the driver to hear it over the general noise level that's present at the time. Of these approaches the most commonly used are acceleration sensors, which make use of piezo ceramics. The sensor is mounted directly on the block, and so listens for sounds transmitted through the structure of the engine. Unfortunately, numerous frequencies in addition to typical detonation frequencies are contained within this noise! However, the use of piezo ceramic sensors has proven to be the most practical method of detecting detonation. Differentiating the sound of engine detonation from the noise of valves opening and closing, pistons rising and falling, cam chains clanking and general under-bonnet noises has proved to be the hardest part of detecting when detonation is occurring. One way to reduce this problem of sorting the wheat from the chaff is to decrease the time for which the sensor is actually listening. 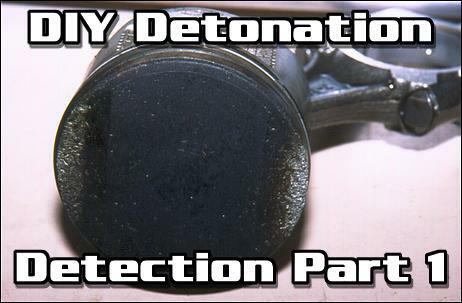 The major noise of detonation for a specific cylinder occurs from shortly after the piston reaches Top Dead Centre on its power stroke to between 60 - 90 crankshaft degrees later. If the detonation signal is allowed pass through to the detection circuit and be averaged only when each piston is in this position, the accuracy of detonation detection improves. Crankshaft position sensing then obviously becomes an important part of this approach. The signal developed by a sensor is processed so those signals that (hopefully!) aren't detonation are filtered out. This is achieved by the use of an approximately 10KHz wide bandpass filter. Beyond the bandpass filter the signal is commonly split into two paths - one branch going on to become an averaged reference signal, with the other signal compared with the reference only during the periods when each piston is in the right position for accurate detonation sensing. 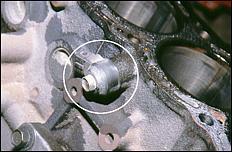 A 'detonation detected' outcome leads to a retard in ignition timing in most factory engine management systems. As you will have by now realised, electronically sensing when detonation is occurring is not at all simple. A number of aftermarket approaches are taken to this problem. Most typical is a general-purpose detonation sensor that is mechanically attached to the block, with its signal output being monitored by a dedicated meter. The meter can display either by means of a bargraph LED display or an analogue needle the severity of detected detonation. One example of this type of approach can be seen in the Safeguard, an interceptor-type module that uses an added knock sensor to detect detonation. Not only is the severity of detonation shown on a row of LEDs, but the appropriate retarding of the ignition timing can also be programmed to occur. Two knock sensors are available to work with the system, with the sensor being selected on the basis of cylinder bore diameter. I was present when Turbo Tune (Adelaide, Australia) dyno-tested a Safeguard unit on a VL Holden Commodore Turbo. The car was running high boost and advanced timing - enough to make it detonate when the non-intercooled air hit the combustion chambers. 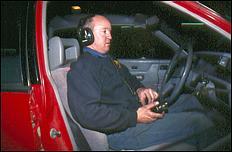 In order that the dyno operator (sitting in the car under test) could ascertain when detonation really was occurring, he was wearing a set of headphones connected to an amplifier box. The amplifier was fed by a microphone, which in turn was physically connected to the engine block. The reverberation resonance generated by detonation generally lies in the range between 2 and 12KHz. The following equation can be used to estimate the detonation resonant frequency for a specific engine. Where the resonant frequency is measured in Hertz and the cylinder radius in metres. Another aftermarket approach is to use the factory knock sensor and its dedicated signal conditioning board - the GM-Delco system is one example that lends itself to this. With this approach, the knock sensor board is modified with a transistor and a LED to indicate when knock is being detected by its matched sensor. While ingenious, this approach falls down when the knock sensor is used on engines other than that which it was designed to match. In fact, one person stated to me of this system "It certainly works - the LED was flashing when I could hear detonation...." which makes you wonder why the electronic knock sensor was needed in the first place! In Australia, Jaycar Electronics have sold a knock detector kit developed by Silicon Chip magazine. This uses the input of a fabricated or factory knock detector, with the electronic inputs including an ignition input signal so that listening only occurs in the right piston positions. As a contributor to that magazine, I was involved in specifying the design of this system, and also tested it in action on turbo cars. And so I'm in a good position to state that the detector is not very good at picking high-rpm knock! As with so many knock detection systems, the problem is that the sensor will detect general engine noise - rather than detonation - if engine rpm is high. The detection of detonation on a variety of engines - especially during tuning or testing - is most easily and accurately carried out using audio detection. If you can hear the sound, detonation is occurring. While appearing simplistic, audio monitoring beats all other systems when the knock detection method needs to be able to be applied to a variety of engines. Next week we show you how to build a very cheap and effective audio-based detonation detection instrument - just A$15 and 15 minutes! Do-it-yourself aero testing on the road!